We only have 24 hours each day. Therefore, in order to be the most effective in our lives (writing, business, personal, etc. ), it is important to evaluate periodically WHERE our time is going. This is especially true for social media accounts like Facebook. I have been evaluating my time recently and realize that Facebook is stealing a lot of my time and I decided to be proactive and do a few things to help. 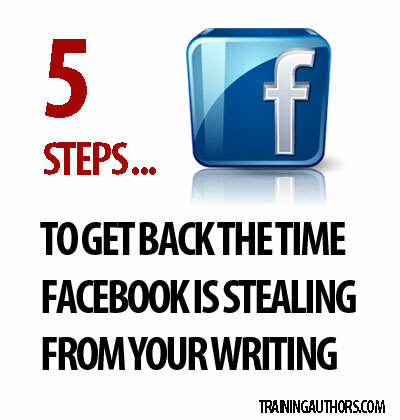 Below I have listed 5 steps to get back the time Facebook is stealing from your writing. I removed “likes” to any pages I don’t follow anymore. You can find your likes on your profile and then go through and unlike pages from there. https://www.facebook.com/help/218692078158295. I also chose to “hide” most of my Facebook groups from my newsfeed. Most of the groups I am in are for networking and marketing purposes. I have found that with the book groups I am in, I end up seeing several of the same posts one right after another from different groups. There is also some material posted in these groups I would rather not see in my feed. GOOD NEWS…there is a way to stay in the group and yet hide the posts from your feed. The next time you see a post from that group in your newsfeed, hover over the right-hand corner to get the drop-down menu…then click “I don’t want to see this.” You will then have the option to click on a link to HIDE ALL posts from that group. Click the link to HIDE ALL and you will no longer see posts from that group in your feed. YAY!!! I “unfollow” certain posts that I have commented on so that I stop getting notifications. Did you know that you can unfollow posts? When you receive a notification for a post you no longer want to follow, simply to that post and then click on the “Unfollow Post” link. Those are 5 steps I have taken to get back more of my time from Facebook. What do you do to help you manage your time on social media? Share in the comments below. Be social! Share this post with your friends and help them get back their time from Facebook as well! Great post, Shelley! Thanks for #2 and 3. I didn’t know that! I have a hard time “unliking” pages when I also have a page that I’m hoping folks like. I tend to change the settings on a page I no longer want to follow so that I’m not seeing it in my newsfeed, rather than taking the step to “unlike” which in most cases, I think, sends a message to the page owner I don’t intend. Most of the time I stay only in the groups. I seldom even look at my news feed. I really love Face Book groups and they have helped me a lot. I think of late the most helpful thing is adding a group or page to my favorites. It’s really helped me to keep up with my posts and has saved me a lot of time.